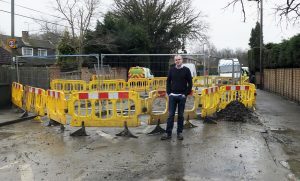 ENGINEERS are to assess the condition of the ageing water main under Littlewick Road in Knaphill, following a second major leak in the pipe in less than a year. The road was closed from early morning last Thursday until 10.30am on Monday while the fractured 15-inch cast iron main was repaired and the roadway resurfaced. A rupture last February was about 50 yards from the burst last week and both incidents flooded several homes, gardens and garages. Resident Paul Edwards said: “We were woken up by a passing motorist who saw the gushing leak, pulled into our drive and repeatedly sounded his horn.